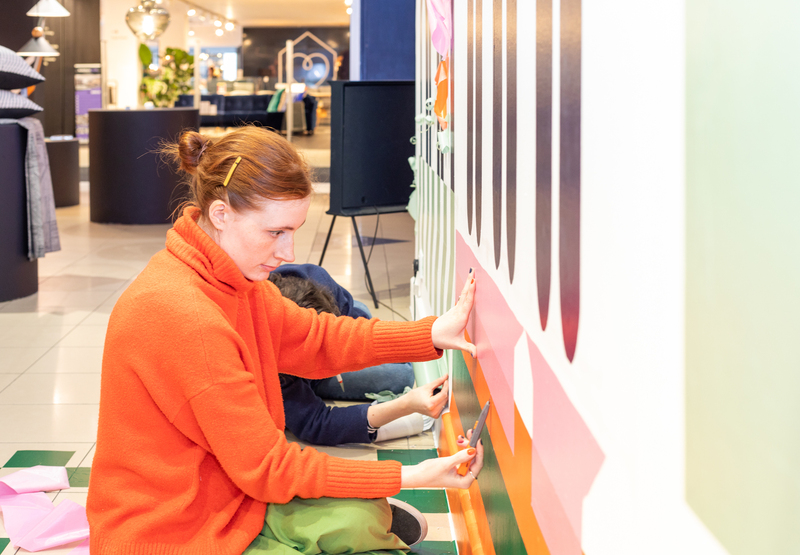 As part of our latest campaign, Designs That Stick, we invited three artists to take over an area of our Tottenham Court Road store. The brief was simple – design a space that features Japanese Washi Tape from Haru. What resulted were three very different installations which were true to each artists’ unique design style. We sat down with our three collaborators to ask about their inspiration behind their spaces. Christine Leech is an avid crafter who describes herself as an “all-round creative type relishing in a weird patchwork career of author, maker, illustrator and stylist.” She is the brains behind the beautiful Instagram account, @sewyeah, which documents her love of crafting and her latest projects. Your window is an explosion of colour. Do you take the same approach in your own home? My studio looks just like the Heals window – it’s really colourful and filled with all my craft materials. It even has a polka dot wall and teal green paintwork. The rest of my house is catching up! At the moment the walls are all grey but I’m planning on a spring clean and making everything white to make all my colourful accessories to really pop! Was there anything particularly challenging about this project? I found this project really fun to do. It was slightly daunting when I first saw the window and how big it was and I was concerned about how the different areas would tie together. But once I had a plan and had marked out the different areas then the sticking became very calming almost meditative process! I used most of my favourite colours in the confetti and every little rectangle was a joy to place. What attracts you to the world of crafting? I love that crafting means I can do so many varied and unusual things – from making tiny felt flowers to covering a shop in confetti! I’ve been making things all my life and to be able to continue to do so and make a living from it is amazing. Crafting enables me to not only have fun making things whenever I feel like it I also meet so many lovely people on the workshops I run. The crafty community is full of lovely souls. Fiona Grady is known for her large scale, colourful artistic works that feature sequences of dispersing geometric shapes. She gave our windows her signature treatment, by cutting pieces of washi tape into triangles and layering them into a geometric pattern. You have done many beautiful window installations. What is it that you enjoy about this medium? I’ve been working with windows for around 3 years using transparent coloured vinyl and for the first time Haru washi tape. I prefer working in public spaces such as windows as everyone can see and enjoy the artworks. The Heal’s storefront is a great platform, it’s exciting to see my work alongside beautifully designed furniture to create a narrative between the window installation and contemporary design. My work is very exacting! To create the symmetrical images it required me and my assistant, Ellie, to mask grids and cut the tape precisely to size testing our mathematical abilities. Usually, I design artworks for white wall gallery spaces or public venues such as cafes it was a fun challenge to think about the artwork in relation to showcasing the Heals products. Have you ever worked with Washi tape before? Did you find it an easy material to work with? This is the third time I’ve worked with Haru washi tape. In summer 2018 I designed an artwork for their headquarters which was a great way to explore their colour palette and learn about the material. Following this, I was commissioned to design an artwork for a family home in West London which was a real pleasure. I think it’s a fun and flexible material to work with – what I love about the washi tapes is they are all a little translucent so you can find new colours by layering them so I feel like I’m painting with tapes. Katy Welsh has been a close collaborator with Heal’s ever since she designed an exclusive collection of cushions for us back in Summer 2018. She has even decorated our windows before so this time we decided to give her a new challenge – to create a mural on one of our 8-metre interior walls. What was the inspiration behind your space? We noticed nods to architectural elements, what is it about these that inspire you? when I was first asked to create a design, the brief was loose and very much open to how I wanted to interpret it. My original idea was to channel cubist still life paintings and create something like a still life that would extend out into the room but as I spoke more with the Heal’s Visual Merchandising team, the idea developed into creating something more graphic. I found inspiration on a recent trip to Frankfurt when I saw an amazing installation of giant velvet archways. I also looked at the Hermès installation by Charlotte Macaux Perelman from last year’s Milan Design Festival and the work of Charlotte Taylor as reference points which made me want to start playing with perspective in the work which was something that was new to me. But really architectural elements, especially pillars, have always featured in my work, and it seemed like a great fit since I was working with an interiors brand! How did you plan your wall art? Designing my piece was quite hard. I made lots of sketches on the way to my final design. I sent one of these rougher sketches to Kevin and he really liked the quality it had so we tried to keep this original naivety in the work during the installation. Measuring and accuracy do not come very naturally to me so working out how big everything needed to be was a challenge, but we got there! How does designing for smaller textiles differ from larger areas? I kept the design process exactly the same for this project as I would for designing a textile. The only difference was thinking about the application – when you design for fabric, you are designing something 2D, but my wall installation came down onto the floor and so it was effectively like designing something 3D. It was definitely the biggest scale I’ve ever worked on too (8m!) and it was quite daunting, but once I had managed to scale everything up that was fine too. It’s really cool to see something you designed on a laptop screen become something so huge in front of your eyes! Visit our Tottenham Court Road store to see the installations in person until 2nd March 2019.